Will the Minimum Wage Continue to Rise? The sharp increase in minimum wage has generated a great debate throughout the nation. 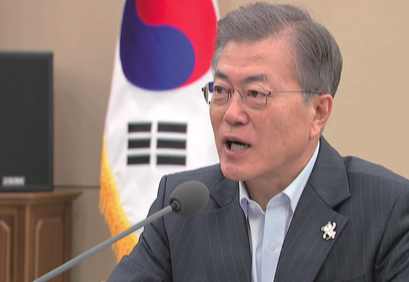 According to President Moon Jae-in’s campaign pledge to raise the minimum wage to 10,000 won during his term, it has increased with the greatest percentage in history (16.4 percent), starting in 2018. With the growth rate applied, the minimum wage per hour is now set at 7,530 won. As reported by the government, the increase of the minimum wage is aimed at ensuring all workers’ “right to live” like a human being, and to improve the overall welfare of working conditions. Meanwhile, since the actual increase began, some noticeable side effects have been seen even within this short period of time. While the attempt to improve working conditions is highly laudable, it should be thoroughly considered whether these side effects are a mere part of trial and error that can be solved, or are problems that will persist. Korea’s minimum wage per hour rate was ranked 15th. However, regarding the minimum cost of living that is needed to live in the Korean society, the minimum wage that is currently set is much lower than what the people need to maintain their lives even at the very basic level. With the increased amount of minimum wage, the government announced that it aims to achieve growth in the nation’s economy, with a particular focus on the alleviation of the income gap, expansion of domestic consumption, and an increase in employment. The Ministry of Employment and Labor explained that this could be achieved in five circulating stages. Once a secured job is given to the people, it would allow the employees to raise their household income through increased minimum wage. Accordingly, with the extra income, the households would make more consumptions. Then, with the increased consumption, the businesses and enterprises would also be able to boost their production and investment, which finally leads to the overall economic growth of the Korean economy. While this theory aims to advance the overall economy in a macroscopic view, the ministry also hopes that it would create other fundamental effects, such as improving the great wage disparity and encouraging more female employment. 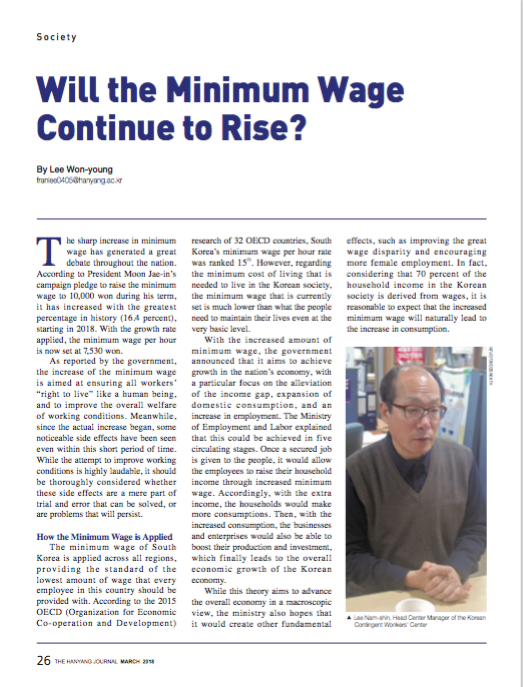 In fact, considering that 70 percent of the household income in the Korean society is derived from wages, it is reasonable to expect that the increased minimum wage will naturally lead to the increase in consumption. Despite all the prospective effects that seem to be hopeful and promising, there are also some side effects that are created due to the increase of minimum wage. One of the greatest problems that is currently much debated in the media is the conflict between employers and employees. Refusing to accept the increase of minimum wage, some employers are taking alternative actions to sidestep the additional increase of personnel expenses. Some well-known cases are the problems related to apartment janitors. The residents of an apartment in Seoul agreed to force the janitors to take shorter working hours. Additionally, there have been disputes between some university campus facility maintenance janitors and the related universities that unilaterally fired the janitors after the increase of the minimum wage. Recent cases also include some employers of franchise industries changing their employees’ employment status from full-time employment to part-time employment. The problems that are being created as a result of the unusually rapid increase of the minimum wage do not seem to be ones that can be solved within a short period of time. “These conflicts between the employees and the employers should be solved by changing the cycle of the society as a whole. The reason why employers are struggling to provide their employees with the increased wage is because of other critical, but rather unnecessary expenses that they need to make, such as but not limited to unusually high rental fees of workplaces and/ or high credit card fees. This is the part where the government and other conglomerates need to step in, and help these small employers. 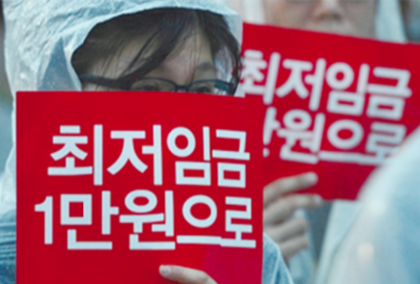 Only with these actions can the society as a whole achieve economic stability,” explained Lee Nam-shin, the Head Center Manager of the Korean Contingent Workers’ Center. The interviewees also added that the government should provide more policies that support employers struggling to meet the needs of their employees. While there are already some policies that provide benefits or incentives to employers who keep up with the minimum wages, all of these are services that can be provided for only one year contemporarily. Therefore, the government should come up with additional actions which can create an environment for people to follow the changing policy without any hardships. Also, we as university students, should also pay constant attention to this matter, fulfilling the duty as future workers of this country.